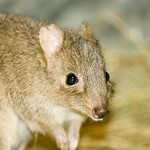 Stretching a foot and a half long with a one-foot tail, the brush-tailed bettong can weigh up to three pounds. 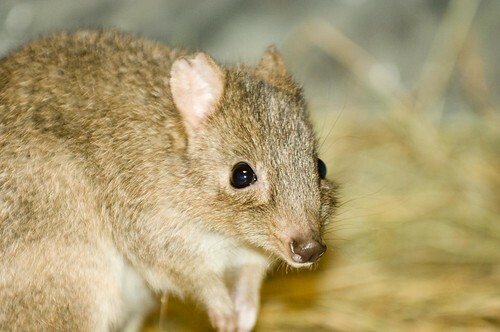 The upper parts of bettong's coat is grayish-brown; the underparts are lighter. The tip of the muzzle is naked and flesh colored. Females have a well-developed pouch. Endangered. Lincoln Park Zoo cooperatively manages brush-tailed bettong populations with other institutions in the Association of Zoos and Aquariums. Nocturnal, terrestrial and herbivorous. Bettongs feed mainly on roots, tubers and legume pods, but there are reports of them feeding on carrion, meat and marine refuse. 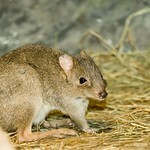 The bettong constructs a nest of grass or sticks and bark. The nests are usually located at the base of an overhanging bush. The length of undelayed gestation is 21 days after which one or two young are born. Just after the first young is born the female mates again, but because of embryonic dispause, development is delayed and partruition of the second young does not take place for 4 months. The females can sexually mature at 200 days, giving the animal a high reproductive rate. 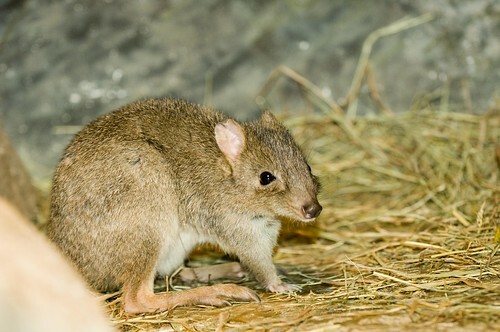 Also known as the rat kangaroo, the brush-tailed bettong's tail is partially prehensile, enabling the animal to use it to carry nesting material.